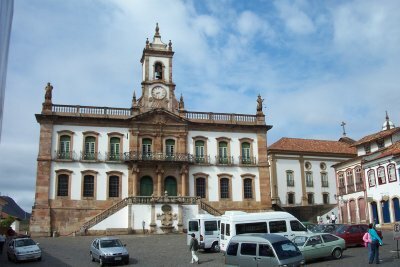 Historic Town of Ouro Preto is a unique representation of baroque architecture in a homogenous cityscape. The city's wealth has its origins in the late 17th century. At this period expeditions to the interior of Brazil started, in search of minerals. 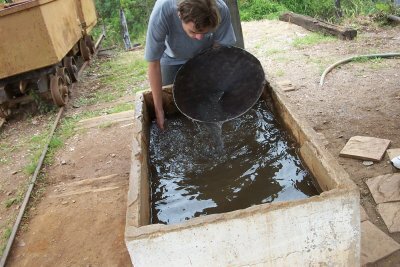 This became succesfull in what now is the state of Minais Gerais: in 1693 gold was discovered here. The exploration for gold was a monopoly of the Portuguese crown. They taxed 20% on the findings. A heavy system for collecting the tributes and taxes was in places. Of course the miners didn't like that, so an uprising took place in 1789. It was put down, and its leader Tiradentes was cut in pieces - his head was displayed on the main square of Ouro Preto. Small settlements of miners in search for El Dorado were joined in 1711 to create the city of Villa Rica (later renamed to Ouro Preto, 'Black Gold'). The settlers were divided in two parishes and in ethnic groups. Each group constructed its own church, bringing in baroque artisans. At the height of its Golden Age, Ouro Preto had some 110.000 inhabitants (mainly slaves). The city was left to itself in 1897, when the state capital moved to Belo Horizonte. Locals here must be in a good physical condition: the town´s cobble-stoned streets go up and down and up again. These locals can enjoy themselves though, living in such a great city, wonderfully preserved and indeed very homogeneous in its looks. I stayed here for three days, which is a good period to get to know the place. I visited museums and churches, but wandering around is also great fun. It doesn't matter where you're going, at about every street corner there's a great view. Some great spots: the Igreja de Sao Francisco de Assis (with Aleidinhija carvings), the Museum de Oratorio and the view down from the road to Mariana. You can also explore one of the huge old mines (Mina de Pasagem) just outside the town. Which I did, of course, becoming some kind of mining expert after visiting other mining WHS in Blaenavon (Wales) and Spiennes (Belgium). In August 2018, I made a day trip by bus from Belo Horizonte to Ouro Preto, a colonial-era town constructed in Brazil’s gold mining area in the 18th century while under Portuguese rule. I spent the day wandering the cobblestoned center, dotted with Baroque churches built with wealth from Brazil’s gold rush. After the gold boom, Ouro Preto was economically isolated for most of the 19th and 20th centuries, which helped preserve its historic buildings and urban pattern. I visited on a Monday, bad news since I couldn't visit the interior of the churches or the museums, but good news since I didn't have to deal with mobs interrupting my photos. There is no doubts that Ouro Preto deserves a visit. The beauty of some churches, specially Nossa Senhora do Pilar and Sao Francisco de Assis, with their mind-boggling golden interiors, and the bucolic early morning views over the town contrasting with the students parties at night offer the visitor a complete pack of culture, South American colonial history and art. 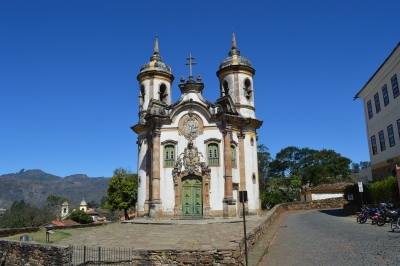 However, Ouro Preto has been preserving its heritage with careleness. First, there is no preservation counciousness, as a historic house in the town's main square recently burned down and a beautiful fountain was destroyed by a truck. Also, the hills surrounding Ouro Preto were dominated by modern and ugly statements, and the once beautiful wide landscapes are now limited to the town itself using the Itacolomi rocks as background. 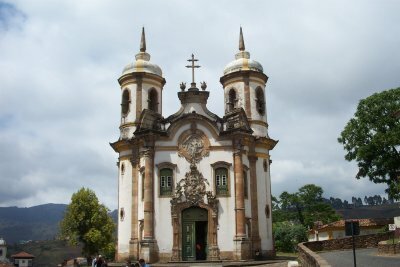 There are no doubts that Ouro Preto deserves a visit, as it is not so far from big centers like Sao Paulo and Rio de Janeiro, and the region is packed with other sensational destinations, including other World Heritage sites like Diamantina and Congonhas, but bad use is consuming Ouro Preto's charm and beauty. Hi! 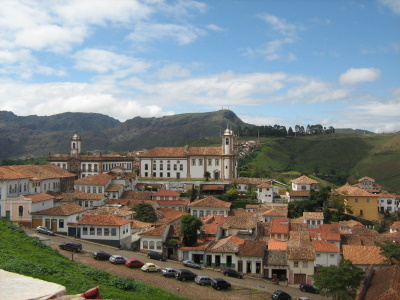 The site is very good and very useful.Talking about Ouro Preto, it's really an incredible city, very preserved! !I felt like the city is 3 centuries ago!The churchs and buildings are very beautiful, so you can't miss it. Slavery: The main tourist mine is named after an African slave. 70 Community Members have visited.